@trolleydriver wrote: That's a really nice setup sanderson. SR ... I'm with you on learning a lot this year. I'm still harvesting chard and lettuce. Most of what I planted in the SFG did well. Eggplant and green pepper were a total flop. I got just one pepper on the pepper plant. Yesterday I took a tiny fruit off the eggplant. The Japaneses beetles had a field day on the bean plants this summer. Me too. Got 3 sweet banana peppers all summer long. Kentucky Wonder pole beans got eaten by the JBs, but managed to produce up to a couple weeks ago. Still frustrating to see those awful things all over the plants. My lone cherry tomato plant was aces. Brandywines did OK, they taste sooooo good, just not particularly productive. Maybe a hybrid in my future, along with my beloved heirlooms. I'm trying to get winterized but there's so much cleanup and stuff to store. 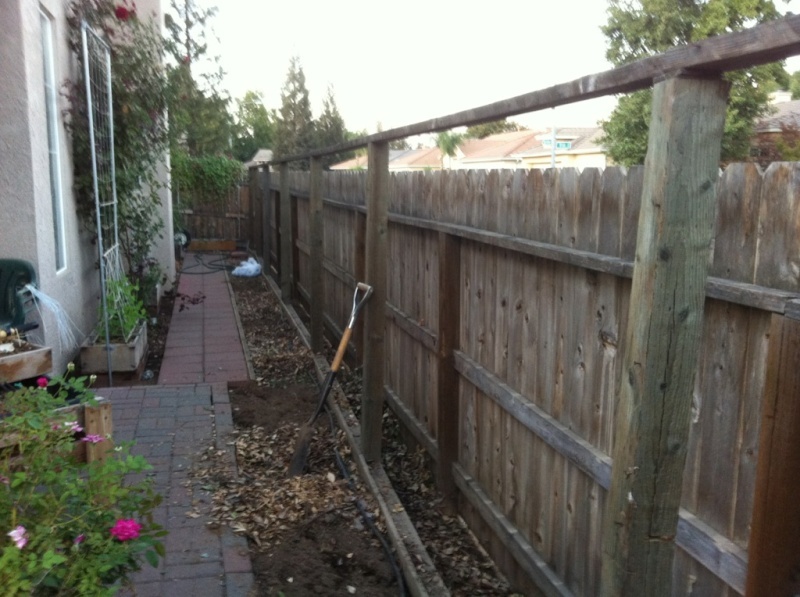 I've worked a couple days removing the rest of the trellises and the star jasmines. Ken removed the root balls. Only 1 of the 31 we planted for privacy is left. I've got City compost, horse manure and coffee grounds to fill the holes from the star jasmines, then re-cover with the ramial chips from last fall. Removing all of the SJ will save labor and time on our general yard work. We will cut the posts to just below the height of the public view fence and install new redwood trellises for the section in the back yard. 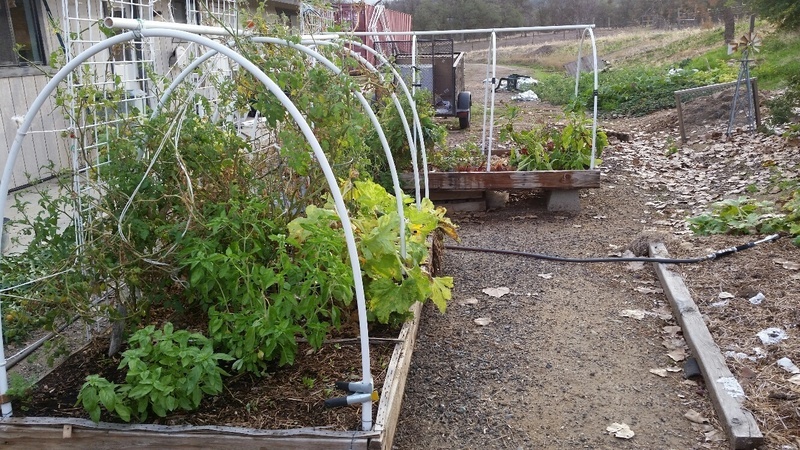 The ones down the side yard will be left uncovered for now so I can experiment with tall sunflowers where the SJ were planted and hanging pots like Jimmycee has. Mine won't look as good as his (everything he touches turns to gold) but I just want something totally different from what we had. I'm only going to invest my efforts in produce and flowers. At the end of the side yard is another 1' x 3' box that nothing would grow in. I think it was just an unusual hotspot. Well, the morning glories I started survived the summer (and Ken accidentally spraying them with bleach water). You can see one of the 1' x 3' beds with snow peas, about a foot tall. The second box on the other side of the rose bush was planted when we got back and nothing has sprouted yet. I moved a couple of worm tubes to new positions or boxes. Harvested a half gallon of castings from the free-range Hilton for the wormless beds. I cut off the tomatoes in the buckets, leaving just enough stem as a handle. Of course, they all regrew and look twice as healthy as they did during the summer. 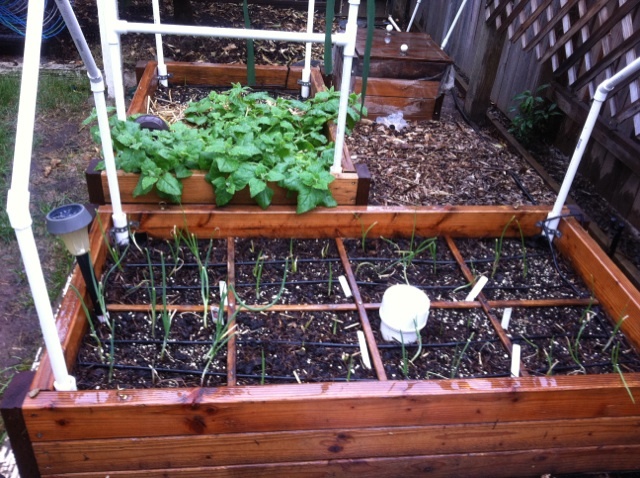 I planted the onion starts, lettuce, garlic cloves and more snow peas in 3 boxes. The onions look like they are dying. Three beds are going to sleep this winter. Three 1' x 3' didn't have anything but weeds this summer. The okra didn't spout in them. ?? I think that's all for right now. 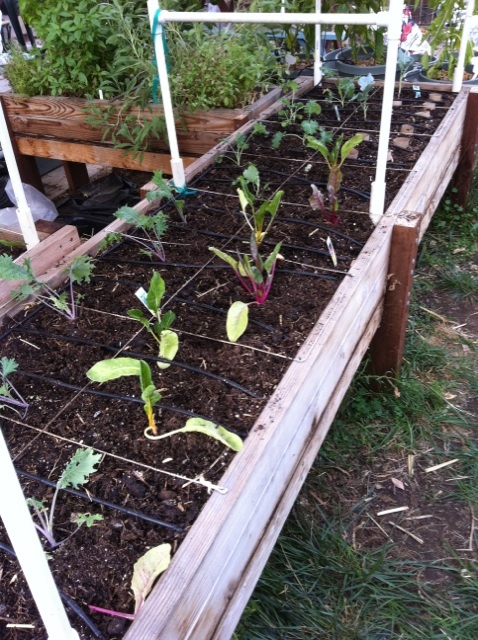 Your Brassicas and chard look great, Sanderson! And the hanging baskets will be fun and pretty. Change is good! sanderson ... it must nice to be able to grow things all year round. Your SFG beds look great. You are doing a lot of work that will pay off in the months ahead. Everything looks great Sanderson. I can't believe how much your brassicas have grown since you planted them. Keep an eye on those morning glory. The previous owners had some plants established in the yard when we moved in- growing like gang busters. They were pretty invasive as they will root layer when they make contact with soil. It took me 3 years to get rid of them. My advice is to keep them trained to the wall and they will not spread. 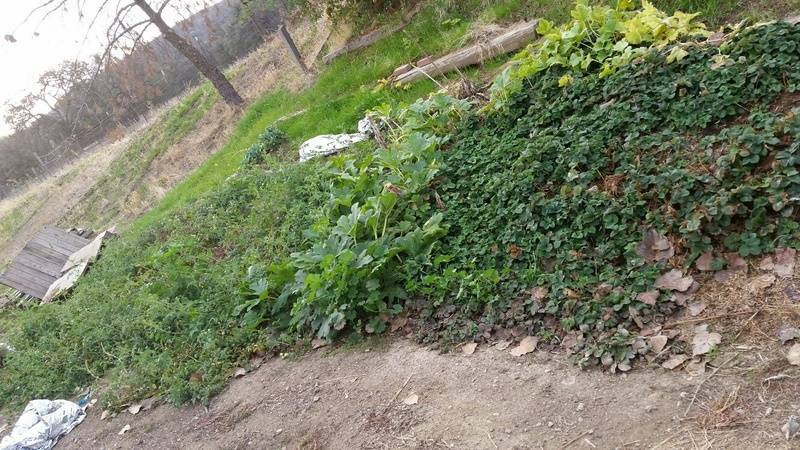 My situation was made worse by the morning glory jumping the neighbor's fence and re-propagating back and forth through the fence, so beware. Thanks all. YS, I heard that they are hard to get rid of once established, so the 1' x 3' box with trellis leaning against the fence seemed the perfect spot for them. It's cloudy and cool outside so I can get in some good work today. I have morning glory at my back sliding door. I don't have any problems with it spreading because of how hot and dry we are. It takes a lot of work to get them going each year but they look so pretty when they do. We are going to take the shade cloth off of the greenhouse this afternoon since our heat should be done for the year. I have things ready to grow in there - 5 different types of tomatoes are already flowering and growing fruits. They will continue to ripen even during the darkest portion of winter. We'll have fresh toms until March at which time the short days earlier in the winter will have prevented them from having enough energy to blossom or fruit. Then by June they're in full force again. I also have 3 different types of peppers and I spotted a volunteer eggplant out in the yard that I'm going to transplant in there. Swiss Chard is a hardy perrenial in there and I'm going to try to nurse a zucchini that's still growing but haven't been very successful with that in the past. These raised table tops will be covered with plastic and will have survival blanket covers for the coldest nights. Lots growing in there that should do well. I have yet to plant out my kale and other winter greens. 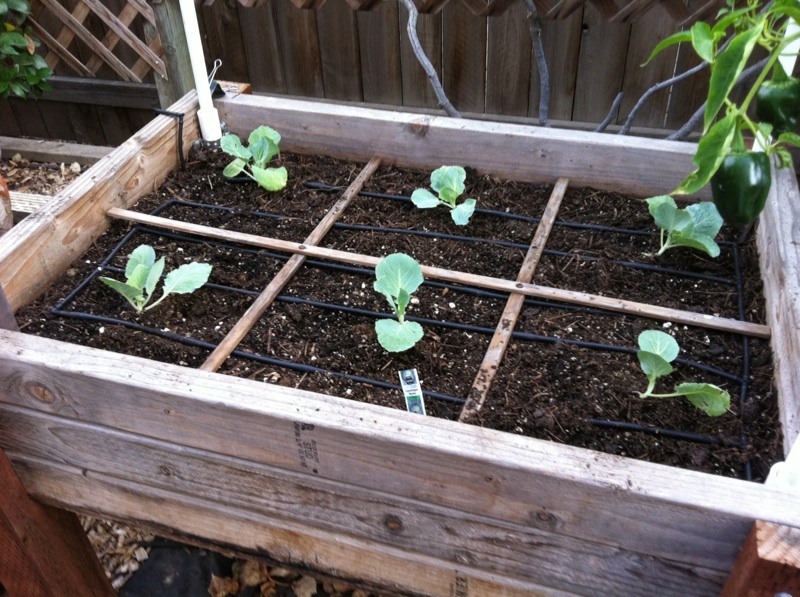 My broccoli and cauliflower starts didn't so I'm going to look for some at the nursery. Maybe the same with cabbage. You have quite a garden there! All the work you have done on the slope not only expanded the size of your garden but should pay off handsomely this winter if we really get the El Nino that is predicted. Some weather guy predicted 15". I'll believe it when I see it. 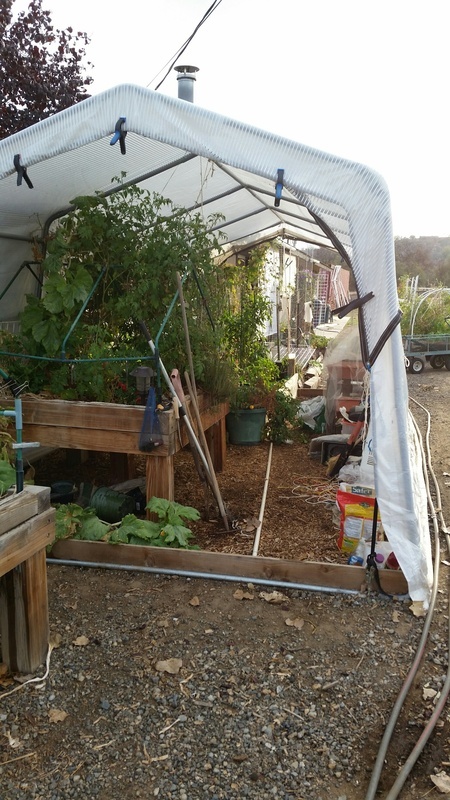 Your green house and hoop covers are inspiring me to set up my little 4' x 4' greenhouse and see if I get any tomatoes from the regenerated tomatoes in buckets. Does the basil overwinter well under cover? Well done, woman. I have never had a basil under cover in the winter so we'll see how it goes. I have two plants there that have produced incredibly well. I have a freezer stocked with bags of olive oil w basil and am drying this last bunch to mix into the sundried and pulverized cherry toms that I use to make tomato paste\sauce out of by rehydrating. It takes hardly and room at all for storage and is very handy that way. 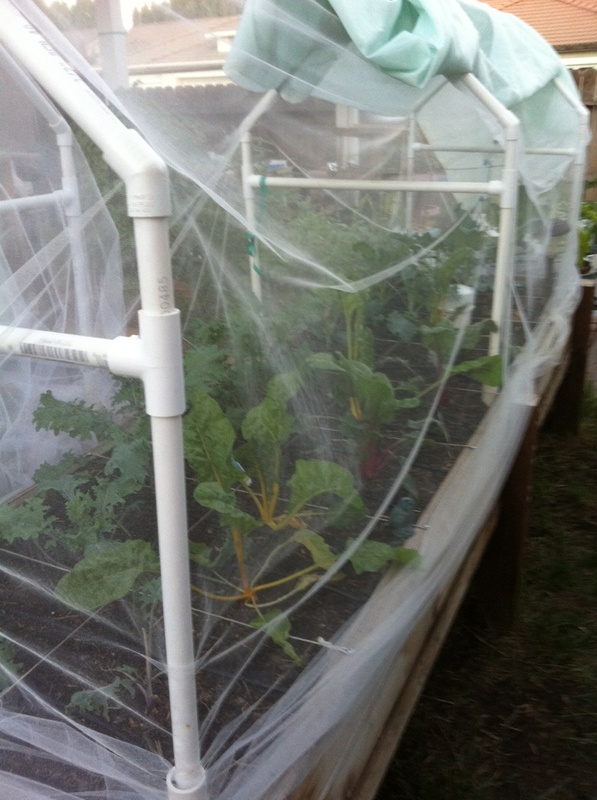 I need to buy a bolt of tulle this winter in preparation for my spring garden. It really helped keep the bugs at bay. Been a few crazy days here, so I feel kind of remiss... BOTH of your gardens look great! Good work, AJR! You will have food all winter! I haven't been on the Forum very much recently. I worked in the garden for 5 days getting ready for the rain we have had all day. Nothing stormy, just constant light and medium rain. I'm glad for all the work I did even though I still have a little more to do. My back has a different opinion. 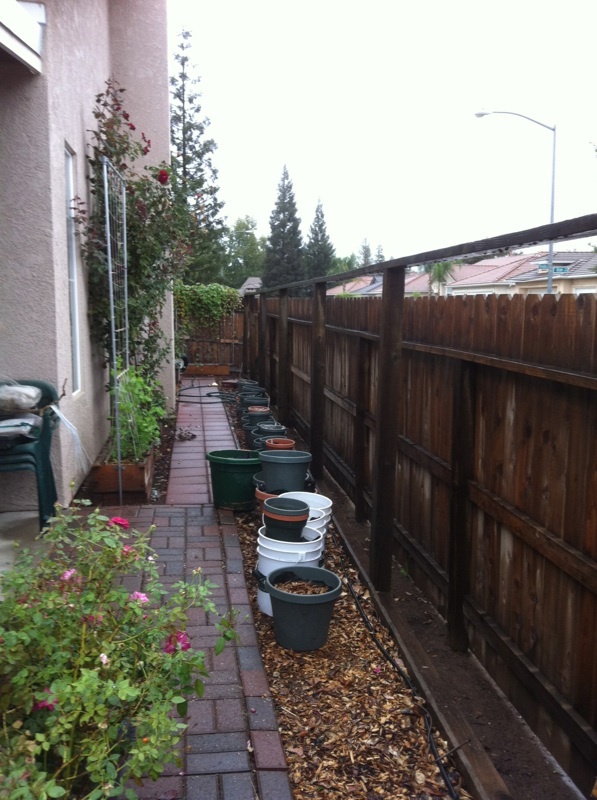 The East side yard last week 10-26-15 with the star jasmines removed. The snow peas in the first box are now 2' tall. The East side yard today during a little break in the rain. All the holes were filled with horse manure, City compost and coffee grounds, then covered with wood chips and leaves. The gutter between the fences cleaned of organic debris. 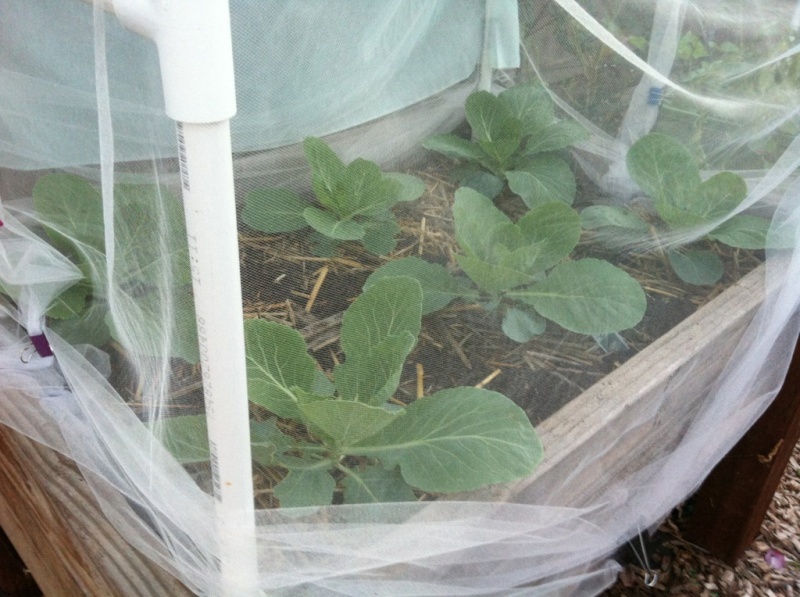 All of the pots were emptied, de-rooted, MM replaced, and covered with fabric and chips to keep out debris and seeds. After I did all of those pots, I realized that I won't be using all of them next summer. Oh, well the MM in the ones I don't use will go into the 13 hanging baskets I recently bought. 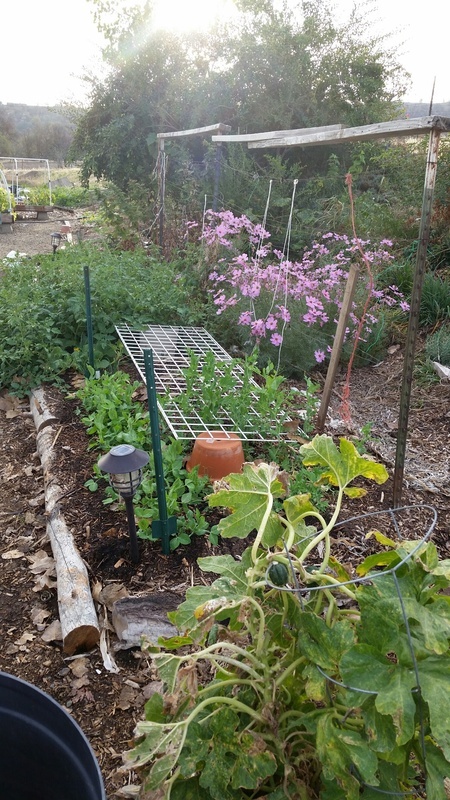 The West box where cantaloupe grow during the summer. The NZ spinach in the adjacent 2' x 3' box. The free-range worm box in the background under the orange tree. I still have a handful of pots to clean, plastic sheeting to cut and measure for heavy rain and frost protection and the patio area to clean up. Some tools to clean, dry and store. Oh, and laying commercial weed fabric around the TTs so I can access them in the muddy times. Feeling like some of the pressure has lifted since last week. Soon it will be seed catalog time! Maybe some seed sales locally. Hope you have good luck with those snow peas, sanderson. Those are probably my favorite vegetable, and they're seven bucks a pound at the store! They're so good in so many dishes or just raw in the garden. Good luck with your back too! My back is almost always some degree of sore, it seems. And when it isn't, I have a weird episode of sleeping funny just to spite myself and get a sore back anyway. Yes, Ibu is a wonderful thing. Back is feeling better after a day off due to rain. It's now sunny so I will have to get some more work done today, maybe just a couple hours worth. $7 a pound? Yep. Very expensive around here. It does take a lot of snow peas to make a pound, though, and nobody wants broken ones, so I can somewhat see why the price should be high enough -- but that's definitely out of my casual eating price range. Marc, with your winter temps, have you tried growing them? sanderson ... I'm glad to hear that your back is feeling better. Lovely sunny warm day (warm for us at this time of the year) where I am. Temp is 21 C (70 F). 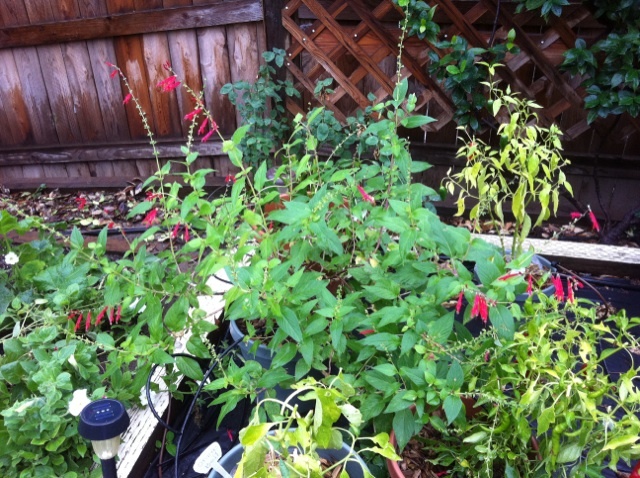 @sanderson wrote: Marc, with your winter temps, have you tried growing them? I was thinking about it, but every packet I saw in the store said plant in spring, or plant in winter for a spring crop. Either way, it was a spring harvest. I figured that's a long time for a plant to last around here without bugs or disease, so wasn't sure about them sitting there all those months and not burning out. You've probably read about my kale starts being successively attacked. 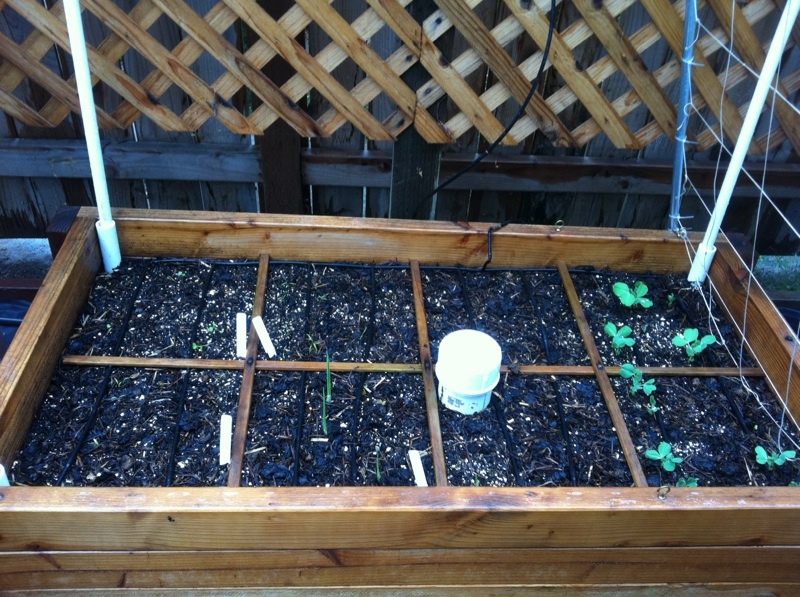 I also figured I could use my space to grow greens for the fall/winter and then try the snow peas in spring. Maybe I done wrong? I dunno. Marc, I plant the snow peas in the late fall. They stop producing/growing at Christmas, then start to pick up again. I pull them out when the beds are warm enough to plant the beans, say April. By then they have PM, anyway. I would try planting them right now in a sunny place and see how many sprout. A bucket or big pot against the fence or a pole in the middle. 42*F predicted for tonight. I ordered unusual PVC fittings yesterday from SnapClamp and received them today. I need to erect my little green house for the tomatoes real soon. I wrestled with the green house today. I raised it another foot high for comfort and of course the plastic cover doesn't fit so I wrestled making a new one. I thought I was going to be so clever making a door but really had to wrestle with that. Back to the drawing board. 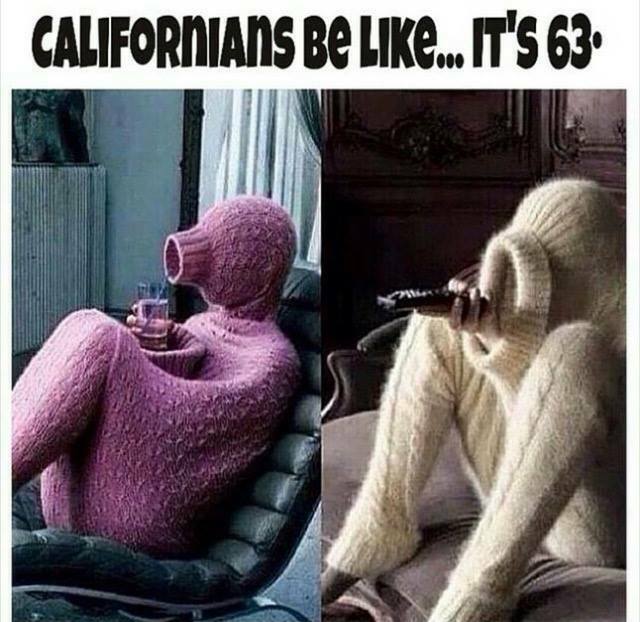 I have to go to Sac for family this weekend but at least the nights will only be down in the low 50s. Slight chance of rain on Monday.